Climb aboard! The Z.O. & O. Express Train offers a 1-mile narrated tour tracking through a tunnel and along Lake Decatur to give you a unique, behind-the-scenes view of our animals. Riders will have the opportunity to watch animals from five different continents like our Emu from Australia and Toucans from South America. Keep an eye out for our South African Cheetahs! One of Scovill Zoo’s most popular attractions, the Z.O. & O. Express has transported tens of thousands of visitors each year. 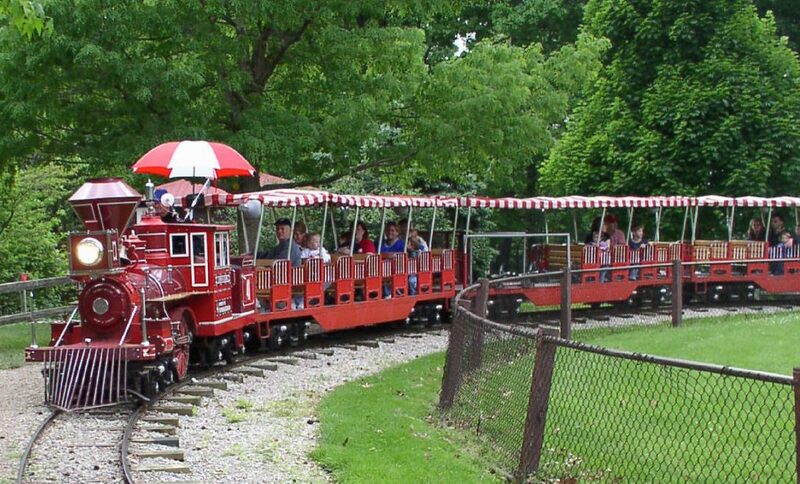 Added to the zoo in 1984, the train is a scaled replica of an 1863 C.P. Huntington Steam Train. C.P. Huntington, a California merchant in the 1800s, built and operated the Central Pacific Railroad. The Z.O. & O. Express is ADA accessible. Passengers in wheelchairs can board the train via a ramp and safely ride in a special, secure wheelchair area. Tickets: $2.75/2.25 for Friends of the Zoo. Children under age 2 are free. Groups of 10 or more may purchase discounted train tickets through our group visitor program by calling at least two weeks in advance at 217/421-7435.